RPH carry in stock two kinds of rubbish chute – one heavy duty type, the other slightly lighter duty but with the advantage of a larger internal diameter. Heavy duty chute with an internal diameter of 500mm maximum tapering to 400mm. Available with a number of different attachments as shown below. 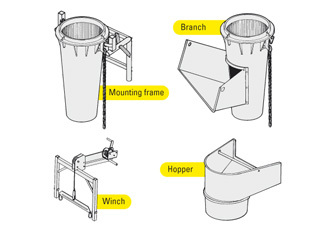 The Supachute is a general purpose chute. Not as hard wearing as the Geda chute but with a larger diameter, it is ideally suited to larger bulky objects that are not too heavy or sharp, e.g. larger bits of waste, roofing felt, membrane or similar objects. The Supachute has a diameter of 750mm and can be installed up to 15m high depending on the materials.